Where are the IceCube neutrinos coming from? Featured Image: courtesy of the IceCube Collaboration. The IceCube Collaboration (who work with data from their South Pole neutrino observatory) caused quite a splash in 2013 when they announced they had observed the first evidence of high-energy astrophysical neutrinos, or neutrinos that originated outside of our solar system. Since that day, theorists all over the world have been speculating about what the sources of these neutrinos are. Supernovae, which occur when a star explodes, and hypernovae, which are substantially more energetic supernovae, are two potential sources of interest. Just one problem: while these processes produce neutrinos, they also produce a gamma-ray flux. This flux has been investigated by gamma-ray observatories such as the Fermi-LAT, and the diffuse gamma ray limits seem incompatible with what would be expected from hadronic models (Astrophysical sources can give off gamma rays via two different creation mechanisms: leptonic or hadronic. Only hadronic models can also create neutrinos, so they are the focus here). The authors tackle this discrepancy in their paper. Looking at hypernovae and supernovae remnants from star-forming galaxies, the authors note that the hadronic models appear to cause an overpopulation of gamma rays that defies the gamma-ray bounds calculated by Fermi-LAT. However, there are some effects that can bring the gamma ray flux to a level compatible with the neutrino flux. Gamma rays from extragalactic sources interact with the cosmic microwave background and the extragalactic background light (EBL) on their way to us. The EBL is leftover in background radiation from star formation processes and is very poorly understood. Uncertainties on EBL models are generally quite large. The authors show that gamma ray absorption as the particles travel intergalactically can be significant. Figure 1: The neutrino and gamma-ray spectra before taking into account the effects of both internal and intergalactic gamma-ray absorption. The black line is the neutrino spectra; the black points are the IceCube data. 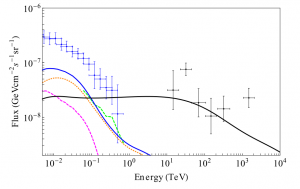 The blue line is the total gamma-ray flux, made up of the diffuse component from the electromagnetic cascade (pink) and unabsorbed diffuse gamma-ray flux that is correlated with the neutrino flux (orange). The green dashed line is the lower limit set by Fermi-LAT for the flux correlated with the neutrino spectra. Note that the diffuse flux overpopulates this limit at some energies. More importantly, they also studied the effect of internal gamma-ray absorption in starburst galaxies (a type of star-forming galaxy that is undergoing an exceptionally high rate of star formation). Due to the large number of gamma rays present in a starburst galaxy, they are extremely likely to interact with their surroundings and form electron-positron pairs. These in turn interact again to form lower-energy gamma rays (typically through a process such as Bremsstrahlung radiation), and the cycle continues. This is known as an electromagnetic cascade. The effect of this cascade is inhibited at lower energies. This is because there is a large magnetic field so the electrons and positrons rapidly lose energy through synchrotron radiation. Synchrotron radiation occurs when a charged particle moves through a magnetic field. This can affect up to 90% of the gamma rays and dramatically change the diffuse gamma-ray flux in the GeV-TeV energy range. The effect of this magnetic field has been largely neglected until now. Figure 2: The same as Figure 1 (above) but with the effect of absorption taken into account. 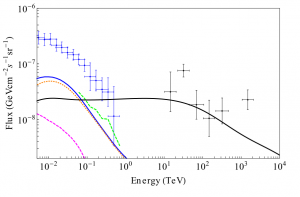 Note that the gamma-ray flux (blue line) no longer overpopulates the upper limit on the contribution correlated with the neutrino spectra (green line). The authors show that this changes the results, and that the tension between the gamma-ray and neutrino spectra disappears. It is still possible for star-forming galaxies to produce the diffuse neutrino spectra that IceCube has observed, while staying within the bounds set by Fermi-LAT. I am a fourth year physics graduate student at Penn State University studying gamma-ray astrophysics. I previously received bachelor's degrees in physics and astronomy from UMass Amherst in 2013. I thought detectors found neutrinos from sn1987a?